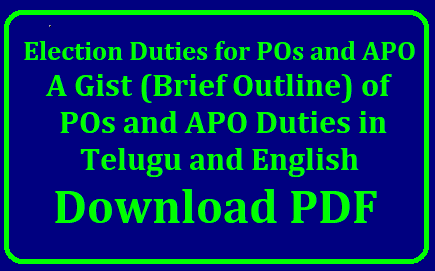 Here in this page we have given a short cut or brief notes in Telugu and English on POs and APOs Duties and Responsibilities they have to perform on the day of polling, before the day of polling and after Polling during Election Duty. This very brief notes is very useful for the Presiding Officers and Assisstant Presiding Officers just to go through it to know about the duties they have to perform during the day of polling, before the day of polling and after Polling . As the cell Phones are not allowed in the polling booth the Presiding Officer POs and APOs can download the brief notes in Telugu aor English and take a xerox of that copy to have a quick reference during the day of polling if they come across any doubts.